Some may call my tree getting and decorating process unconventional but for me it works (kind of). So I thought I would share my expert advice with all of you (in a very sarcastic way)!!! Pick out the prettiest real tree at your local Christmas Tree "Farm" and make sure to get a photo of you and your tree! Bring tree inside and get it straight in the Christmas tree stand. Since the first two steps were a lot of work and you need to let the branches fall anyway go out for cocktails with your friend to relax and recover. Wait a few more days because you are very busy doing important things like going out for dinner and sangria at a local tapas restaurant. Then when the feeling hits you add the lights to your tree just as you remember that last year you said to yourself "don't forget to get more lights for your tree next year." Oops I forgot! Someone remind me for next year! Enjoy your tree with just lights for a few more days and then just for kicks throw the tree topper on too! Make sure to enjoy more sangria while get the big bow just right! Oh and just for fun treat yourself to a Pizza Hut personal pizza from Target too! I mean you shouldn't have to cook when you have SO much to do with getting your tree topper on! 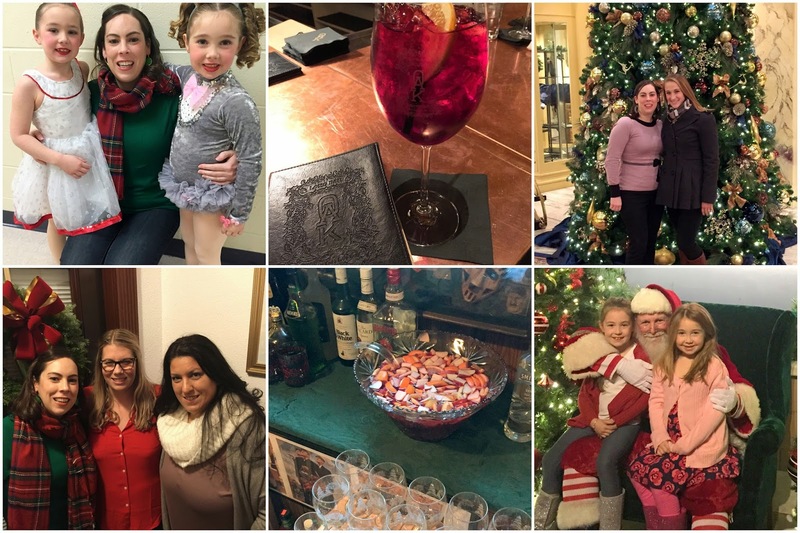 Do Christmassy things like going to the Nutcracker, entertaining an out of town friend with cocktails and Christmas trees, attend Christmas parties and take your nieces to The Enchanted Village. Then when all of that is done plus your shopping and wrapping you should have time to actually decorate your tree! Speaking from personal experience I got my ornaments on the tree with three whole days to spare!!!! 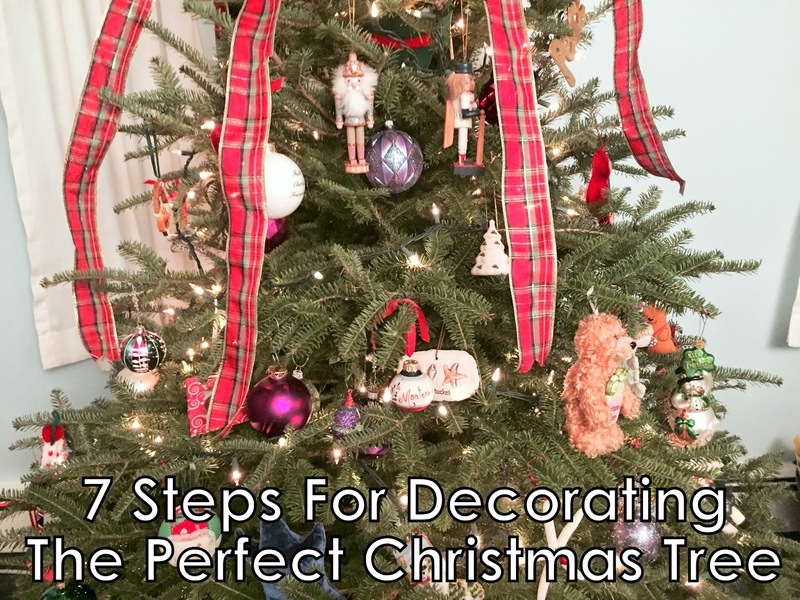 Enjoy your beautifully decorated tree every night when you come home from work. If you are like me you will put it in your bedroom where you spend the majority of your time laying in bed while blogging and watching tv! Here's hoping that next year it doesn't take me three weeks to complete these seven steps! Someday when I live in a bigger place I want more than one tree so I can have themes and if/when that happens I'll have to be much faster to make it all happen! Since I hardly blogged in December I didn't get a chance to share all of the random photos on my phone and I don't want to forget all of the fun Christmassy things from this year so consider this a Christmassy photo dump! 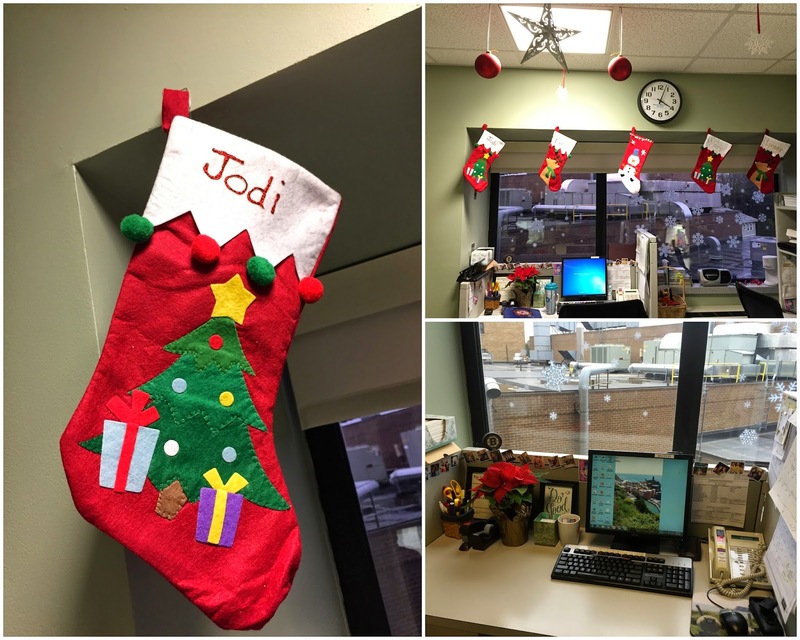 My office mate got in the spirit this year by decorating our office. She figured if we had to spend the majority of our time at work we might as well have it look pretty! There are four of us jammed into this office and she even got a stocking for my intern (who doesn't have an office but spends a lot of time in ours). I must say I'll be sad to see the Christmas decorations go next week. Oh and Santa forgot to come to the hospital because my stocking is STILL empty! I debated doing Christmas cards this year even though I love them and it is one of my favorite parts of Christmas. I love snail mail and finally found something I liked! At our December Fashion Plates Committee meeting one of the committee members, Mary Ann always brings/makes the BEST snacks! She made this twist on tomato, mozzarella and basil to look like a Christmas tree. I had to get a photo before we devoured it! 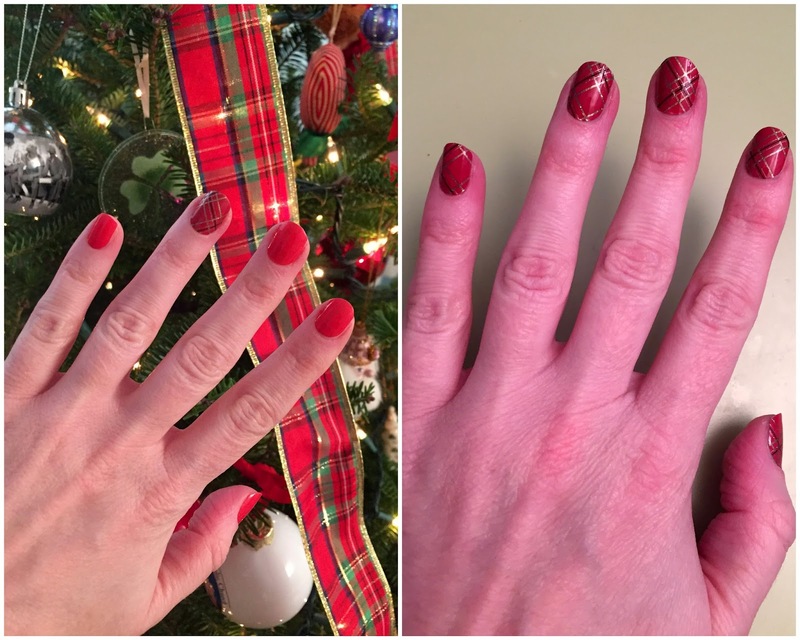 My friend Stacy sent me Jamberry nails for Christmas so I had to do a couple of different looks over the holidays! Love the way they came out only wish they would stay on me longer. I find that they start peeling at the top after a couple of days and not sure what I'm doing wrong!! I think I ate enough sweets in the month of December to last me a life time. I'm really not even exaggerating. It was just too much but what can you do when people gift you sweets every day at work?! Many of the nursing homes that we refer patients to brought us sweets and our hospitalists group gave us the cake! It was all so good. I cut some back branches off of my Christmas tree to make this little arrangement for my kitchen counter. So simple but I love the way it looked! 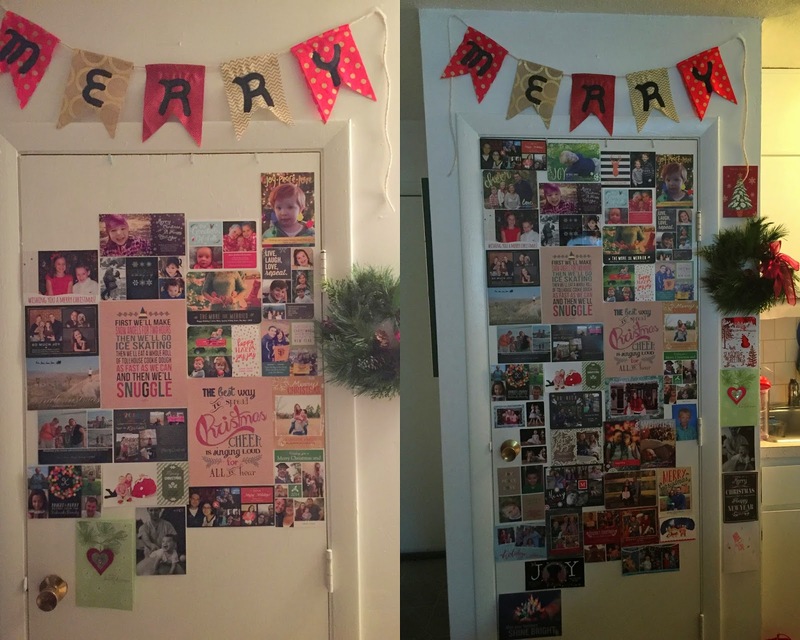 I love seeing my door change throughout the month as more and more cards come in the mail! This is the only Christmas "decoration" that I will leave up past this weekend. I enjoy looking at them for several months. The mall near me that I refer to as "the fancy mall" does a beautiful display for Christmas. I just love this tree and all the presents hanging from the ceiling! My mom sent me this photo after the girls made fun Christmas trees! So colorful and pretty! Right near where I work are two houses next to each other that do a HUGE light/Christmas display. It really is worth seeing and fortunately I had to go by there one night (it is out of my way but I had an errand to do right near it). I took this photo from my car so unfortunately you can't see the other house but it is awesome! I wonder what their electric bills are???!!! That's a wrap! I love Christmassy things!!!! Christmas day we all gathered at my parents' house around 1 PM which allowed for sleeping in (well for me anyways since no little kids live in my house)! We spent most of the day eating and watching the kids open gifts. Along with my two nieces, my cousin's two kids Laney and Callen were there too! I didn't manage to get photos of everyone but I did catch some fun moments! I love this photo! Cathy bought Callen a whistle while on her cruise and he got a kick out of it when she showed him how it worked. She also got the girls bracelet bells so we were all giving her the evil eye for buying loud gifts. Lol! How many attempts do you think it took to get this photo? I think I took 5 and this was the best I could do! This was with several adults standing behind me trying to get all of the kids' attention! They are all so cute and they had such a fun day. Christmas is so much more fun with kids in the family! Every year we do a family photo on Christmas. Our family friend who joins us for all holidays is our photographer and she did a good job this year! We are all looking except for Callen but he gets a pass! After the serious one we had to do a silly one too. . . The adults don't really exchange gifts but we do a Yankee Swap every year. Everyone buys one gift for $40 and then we pick numbers. This year there were 15 and I got number 15!!!! That is the first time that has ever happened and I was very excited. I ended up with two Christmas wine glasses, a Home Goods gift card (that I already used) and a Kohls gift card! For some reason there was a lot more stealing this year than usual and it made it a lot of fun. I think Katelyn got stolen from the most but luckily still ended up with something she wanted! The kids don't participate but they sure love stealing helping! How many people does it take to open the gift?! We were all anxious to know what this BIG gift was since it certainly wasn't alcohol or a gift card. It was a really nice full length mirror! I just love this photo of Peyton looking like a teenager lounging on the couch with her new kid's Kindle!! Oh and don't worry. . . the selfie stick made it to my parents' house for the Christmas day fun! Since 2014 was the year of the selfie it only made sense that some selfies (or usies and groupies) documented the day! It was such a fun and warm (close to 60 degrees) day. It always goes by way too fast! I'm savoring the last few days of the Christmas season and enjoying my tree until this weekend! I hope you all had a wonderful Christmas. I certainly did and I'm so thankful to have family to celebrate the day with each year. 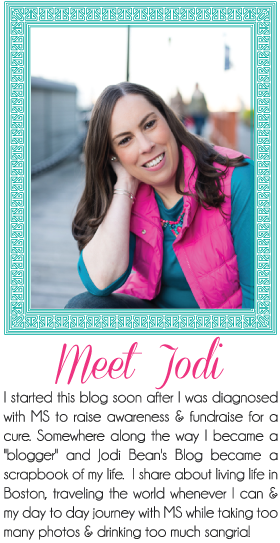 I took a little blogging break (aka I was too lazy to blog over the long weekend and after work this week)! I do want to share my photos from Christmas Eve and Christmas before the end of 2014 so I'm cutting it close! I worked on Christmas Eve but managed to sneak out of the hospital at 3 and get to my brother's house by 3:30. My immediate family plus my Aunt Cathy go to Allan's house every year. A few years ago we started opening our gifts on Christmas Eve since Christmas day is so busy with many more people. It works out well and there are two little girls who especially like this tradition! Their excitement was hilarious and I managed to bribe them for a photo in front of the Christmas tree before opening began! Frozen was on TV so that worked out well since it is Ella's FAVORITE movie and many of her gifts were Frozen items! Don't worry. . . later we watched Christmas movies! One of the gifts I gave the girls were giant slinkys. They were the first gifts I bought all the way back in June when I was in Michigan (for the 2nd trip). They were pretty cool and hopefully won't break/tangle as quick as the small ones. Ella gave me a selfie stick and we had to try it out! I'd say it was the best gift ever! Lol! 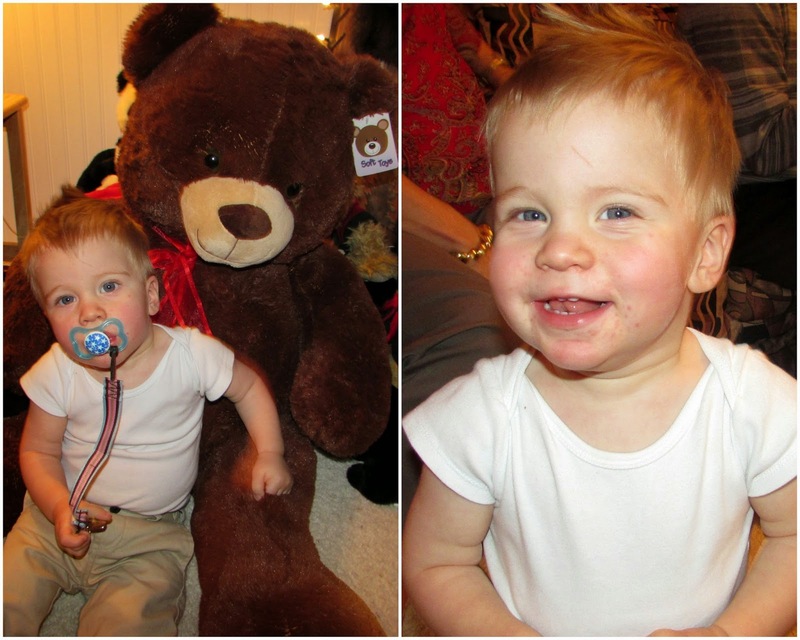 My dad's favorite gift was this giant teddy bear! Yes you read that right - it was a gift for my dad not the girls but safe to say they loved it too. My dad gets a new bear every year and my parent's house looks like a toy store at Christmas time! Ella had fun playing with Cathy. She wanted Olaf to ride away on her unicorn! Unfortunately this is the only family photo we got and it isn't the greatest due to the lighting. But everyone is looking and has their eyes open so we'll call it a win! Every year on Christmas Eve we order Chinese food for dinner so that nobody has to cook. We always eat way too much food and usually are too full for dessert so I had to laugh when this was my fortune! 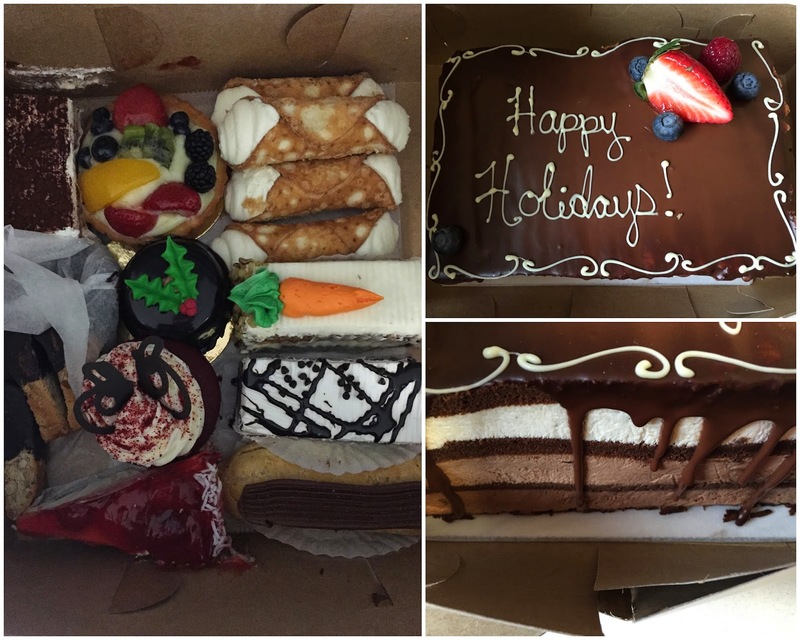 I think I ate my fair share of desserts all week at work leading up to Christmas! Christmas Eve was relaxing and fun. We had a nice time exchanging gifts and eating! Ha! I got a pair of Converse sneakers that I wanted, two Alex and Ani bracelets, a sweater from J. Crew, a ticket to Newsies (for when it comes to Boston this summer) and a few other things including gift cards and cash! All in all a great night!